Background: H1N1 influenza has a broad spectrum of clinical and radiological manifestations. We witnessed a pandemic of H1N1 influenza in the year 2009, an epidemic in 2015 and it continues to cause localised outbreaks to this day causing significant mortality and morbidity. The severity on a chest X-ray and its correlation with the outcome needs evaluation. Objective: To assess the radiological manifestations of H1N1 influenza patients at a presentation in the 2017 outbreak in India in a tertiary care setting and ascertain the most common pattern of radiological involvement. To determine the association between the radiological manifestations of H1N1 pneumonia and the patient outcome. To ascertain if co-morbid conditions contributed to the adverse patient outcome. Methods: A retrospective (December 2016 till July 2017) analysis of the clinico-radiological data of all the inpatient cases positive for H1N1 was done at a tertiary care chest institute in Bangalore, India. The patients’ outcome was divided into two groups. A: Recovered and discharged and B: Death. The chest X-rays done at presentation to our hospital were used as the radiological tool. Results: 75 patients were included in this study. Cough, dyspnea and fever were the usual presenting symptoms with an average duration of 7 days, prior to presentation at our hospital. Bilateral midzone and lower zone consolidation was the most common radiological pattern. Patients with a normal chest X-ray had a significantly better outcome. An absence of pleural involvement and lower scores on a severity scale were associated with a better outcome. Diabetes mellitus was the commonly associated co-morbidity. The presence or absence of a co-morbidity did not influence the outcome. 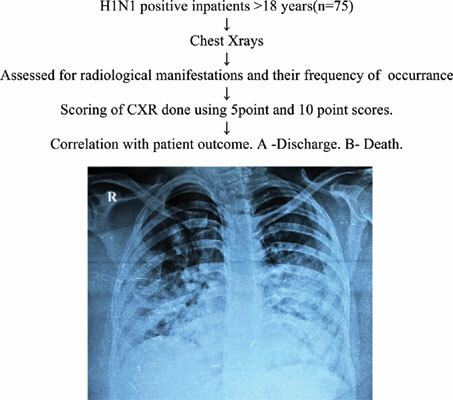 Conclusion: In a resource-limited setting, chest X-rays can be used to prognosticate patients with H1N1 influenza. The more the number of zones involved would implicate more complications and greater risk of death. 2017, chest x-ray, consolidation, H1N1, outcome, radiology, scoring.